Cheap flights to Hawaii: Honolulu for only €694! British Airways and American Airlines now offer cheap flights to Hawaii! 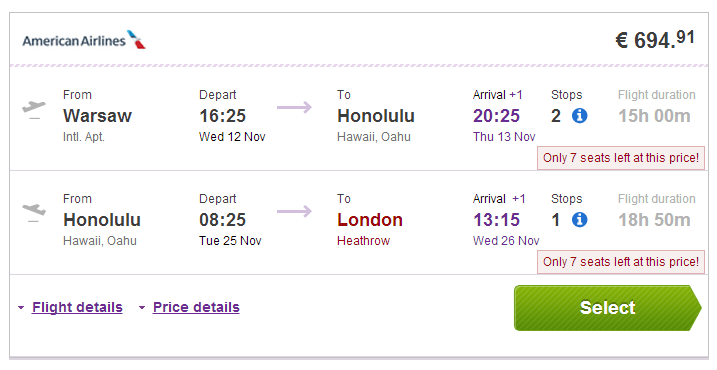 Multicity flights Warsaw-Honolulu-London are available for only €694! You can also fly from Prague for €744 more or to other islands in Hawaii such as Kona or Kahului or Lihue for the same price. Regular price to Honolulu is usually around €1000. Ryanair connects both Warsaw and Prague with London through their low cost flights. Book via Budgetair (click on Show extra search options to enter return to London). « Cheap flights to Thailand: Bangkok for €374!